How Young Will They Be? 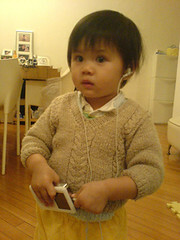 Today my friend's daughter became one of the youngest user of an iPod. I kind of donated my old 3rd generation iPod to my friend's daughter, who is 2 and a half. So she is now an official Apple product owner. According to her father, she now listens to Sesame Street on her new iPod. I hear that Jane also favors Barnney. PS: I am happy to say that she does not do "Windows" (including the OS) and has started to use a Macintosh PowerBook.